The second edition in Robert Taylor's 'Wings of the Luftwaffe" collection. 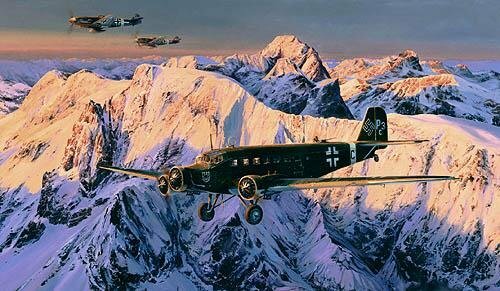 A Ju52 Luftflotte 2, escorted by Me109s of JG-53, transports important military personnel over the Dolomites in the summer of 1942. With the setting sun illuminating the mountain tops in a brilliant light, the panoramic vista is both chilling and spectacular. As the aircraft lumbers across the impressive mountain scenery, members of the High command can be seen in conference in the cabin, while the crew in the cockpit concentrate on their 'Special Duties' flight plan the Ju52 became the Luftwaffe's primary wartime transport aircraft, taking part in every German army land operation during World War II. Overall Prints Size: 35" X 24"
Robert Taylor has been joined by FIVE distinguished Ju52 pilots and aircrew and TWO high scoring Luftwaffe Aces who flew the ME109 in combat during World War II, making a total of SEVEN signatories signing his edition 'Special Duties'.